Anthocyanins are widely used as natural colorant and nutritional additive in food products. 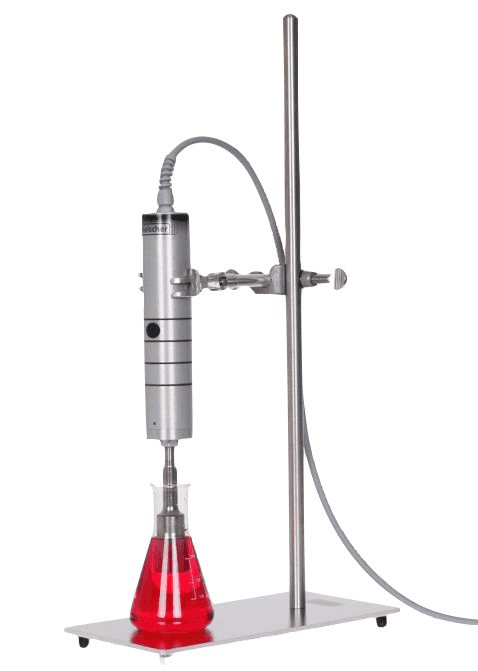 Ultrasonic extraction promotes the release of high-quality anthocyanins from plants resulting in higher yields and a rapid process. 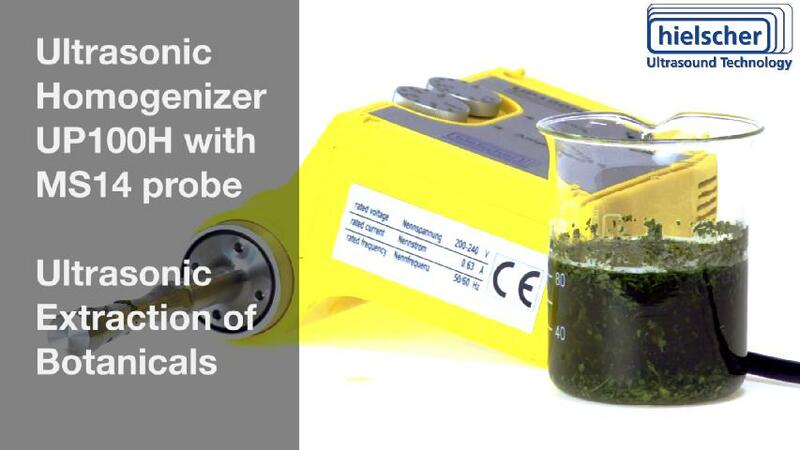 Sonication is a mild, green and efficient technique for the industrial production of food-/pharma-grade anthocyanins. Anthocyanins are widely used as natural colorants in the food industry. They have a wide spectrum of colour tones, ranging from orange through red, to purple and blue, depending on the molecular structure and pH value. The interest in anthocyanins is not only based on their colouring effect, but also due to their health-beneficial properties. Due to growing environmental and health concerns in regards to synthetic dyes, natural dyes are a great alternative as environmental-friendly colorant for the food and drug industry. Ultrasonic Anthocyanin Extraction from Purple Rice Oryza Sativa L.
Purple rice of the strain Oryza Sativa (also known as Violet Nori or violet rice) is extraordinarily rich in phenolics such as the favonoid group of anthocyanins. Turrini et al. (2018) used ultrasonic extraction to isolate polyphenolics such as anthocyanins and antioxidants from the caryopsis (in whole, brown, and parboiled form) and the leaves of purple rice. 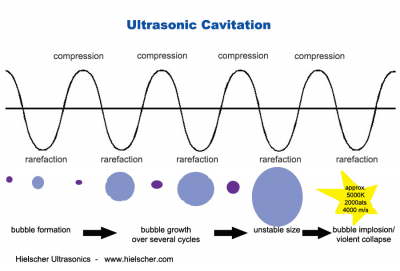 Ultrasonic extraction was performed using a Hielscher UP200St (200W, 26kHz, pic. left) and ethanol 60% as solvent. In order to preserve anthocyanin integrity, the ultrasonic extracts were stored at −20°C, which allowed to store them for at least up to three months. Cyanidin-3 glucoside (also known as chrysanthemin) was by far the major detected anthocyanin in ‘Violet Nori’, ‘Artemide’ and ‘Nerone’ cultivars investigated in the study of Turrini et al., whilst peonidin-3-glucoside and cyanidin-3-rutinoside (also antirrhinin) were found in lower amounts. The violet leaves of Oryza Sativa are an excellent source of anthocyanins and total phenolic content (TPC). With an amount approx. 2–3-fold higher than those in rice and flour, the Oryza leaves present an inexpensive raw material for the extraction of anthocyanins. An estimated yield of about 4 kg anthocyanin/t fresh leaves is significantly higher than those of 1 kg anthocyanin/t rice, calculated on the basis of the medium anthocyanin amounts detected in ‘Violet Nori’ rice (1300 µg/g rice, as cyanidin-3-glucoside) for a yield of about 68 kg of rice from 100 kg paddy. Ravanfar et al. 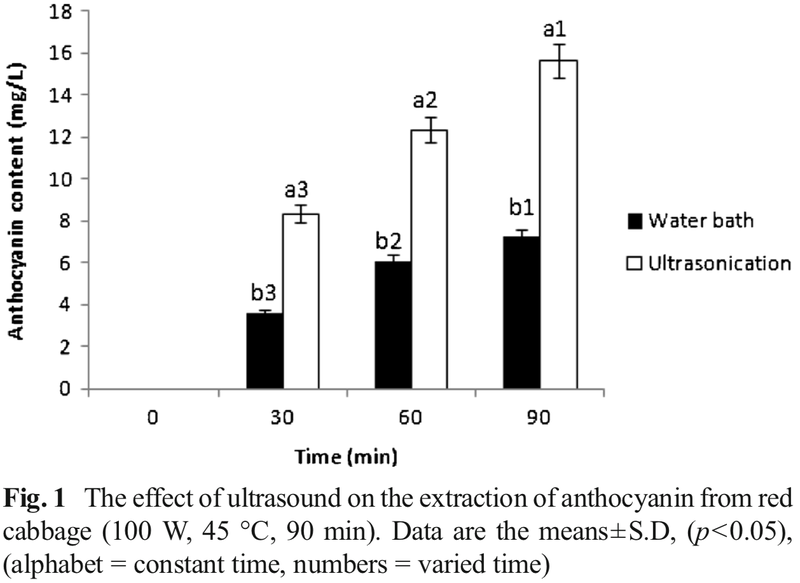 (2015) have investigated the efficiency of ultrasonic extraction of anthocyanins from red cabbage. 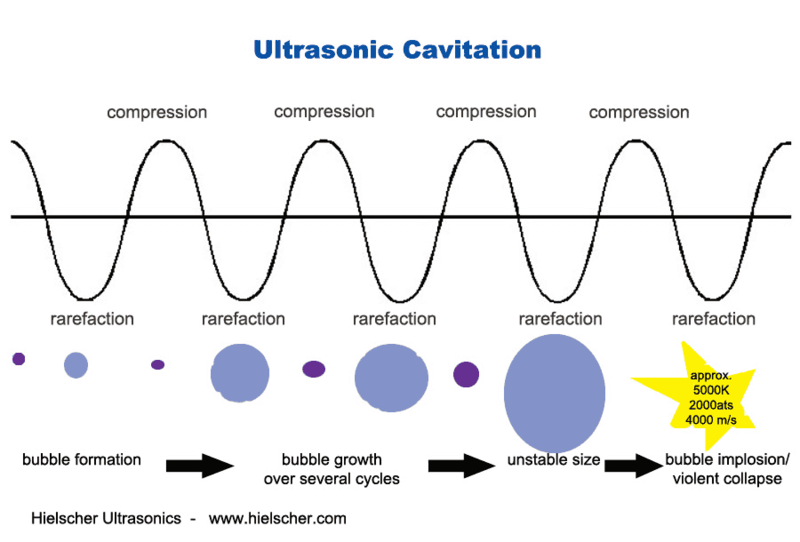 Ultrasonic extraction experiments were carried out using ultrasonic system UP100H (Hielscher Ultrasonics, 30 kHz, 100 W). 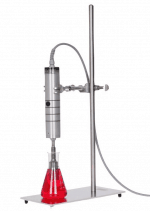 The sonotrode MS10 (10mm tip diameter) was inserted in centre of a temperature controlled jacketed glass beaker. Freshly cut red cabbage pieces of 5mm dimension (cubic shape) and 92.11 ± 0.45 % moisture content were used for this experiment. A jacketed glass beaker (volume: 200ml) was filled with 100ml of distilled water and 2g of red cabbage pieces. The beaker was covered with aluminium foil to prevent loss of solvent (water) by evaporation during the process. 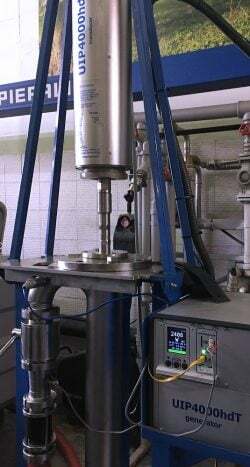 In all experiments the temperature in the beaker was maintained using thermostatic controller. Samples were finally collected, filtered and centrifuged at 4000rpm and supernatants were utilized to determine the anthocyanin yield. Extraction in water bath was carried out as control experiment. The optimum yield of anthocyanin from red cabbage was determined at the power of 100 W, the time of 30 min and the temperature of 15°C which resulted the anthocyanin yield of about 21 mg/L. Due to its color changes on pH value and its intense colouring, red cabbage dye has been used as a pH indicator in pharmaceutical formulations or as a antioxidants and colorants in food systems, respectively. Ultrasonics intensifies the extraction of anthocyanins from plant material significantly. Other studies demonstrate the successful ultrasonic extraction of anthocyanins from blueberries, blackberries, grapes, cherries, strawberries, and purple sweet potato amongst others. 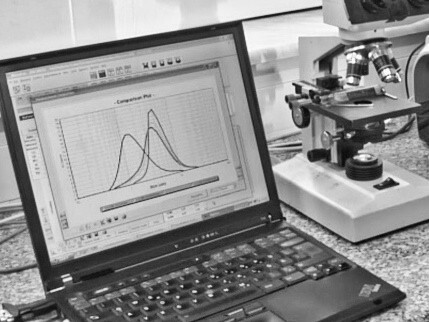 Hielscher’s broad product portfolio ranges from small, powerful lab ultrasonicators to robust bench-top and fully industrial systems, which deliver high intensity ultrasound for the efficient extraction and isolation of bioactive substances (e.g. anthocyanins, gingerol, piperine, curcumin etc.). All ultrasonic devices from 200W to 16,000W feature a coloured display for digital control, an integrated SD card for automatic data recording, browser remote control and many more user-friendly features. 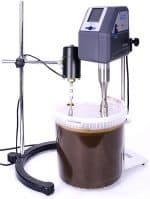 The sonotrodes and flow cells (the parts, which are in contact with the medium) can be autoclaved and are easy to clean. Hielscher’s robust ultrasonic processors are built for 24/7 operation under full load, require low maintenance and are easy and safe to operate. A digital colour display allows for a user-friendly control of the ultrasonicator. Our systems are capable to deliver from low up to very high amplitudes. For the extraction of cannabinoids and terpenes, we offer special ultrasonic sonotrodes (also known as ultrasonic probes or horns) that are optimized for the sensible isolation of high-quality active substances. 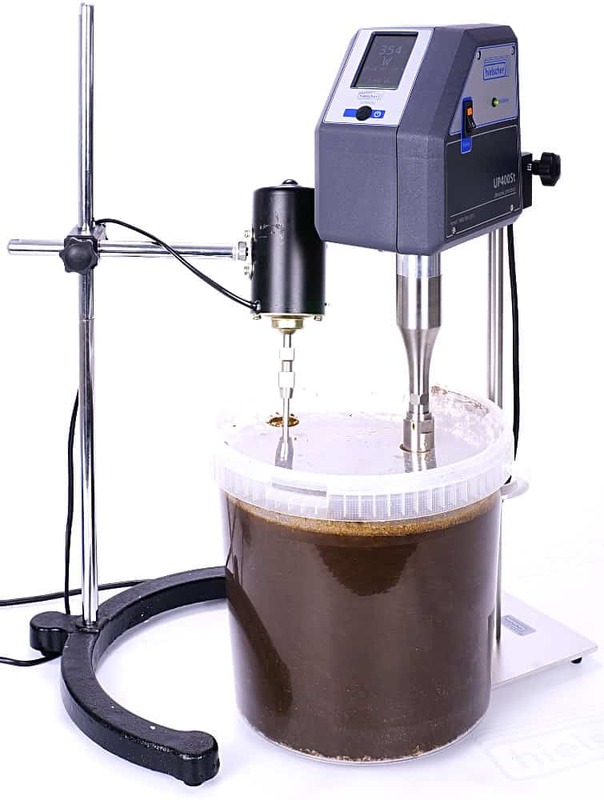 All our systems can be used for the extraction and the afterward emulsification of cannabinoids. The robustness of Hielscher’s ultrasonic equipment allows for continuous operation (24/7) at heavy duty and in demanding environments. Chemat, Farid; Rombaut, Natacha; Sicaire, Anne-Gaëlle; Meullemiestre, Alice; Fabiano-Tixier, Anne-Sylvie; Abert-Vian, Maryline (2017): Ultrasound assisted extraction of food and natural products. Mechanisms, techniques, combinations, protocols and applications. A review. Ultrasonics Sonochemistry 34 (2017) 540–560. 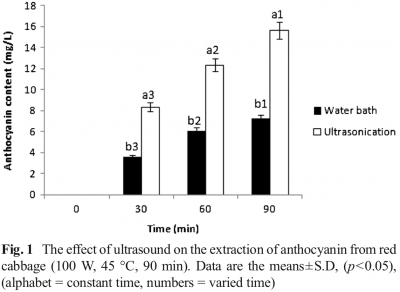 Ravanfar, Raheleh; Tamadon, Ali Mohammad, Niakousari, Mehrdad (2015): Optimization of ultrasound assisted extraction of anthocyanins from red cabbage using Taguchi design method. J Food Sci Technol. 2015 Dec; 52(12): 8140–8147. Turrini, Federica; Boggia, Raffaella; Leardi, Riccardo; Borriello, Matilde; Zunin, Paola (2018): Optimization of the Ultrasonic-Assisted Extraction of Phenolic Compounds from Oryza Sativa L. ‘Violet Nori’ and Determination of the Antioxidant Properties of its Caryopses and Leaves. Molecules 2018, 23, 844. 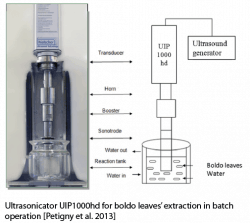 How Does Ultrasound-Assisted Extraction Work? 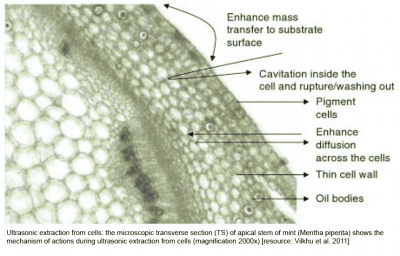 Ultrasonic irraditation of plant material fragments the matrix of plant cells and enhances the hydration of the same. Chemat et al. 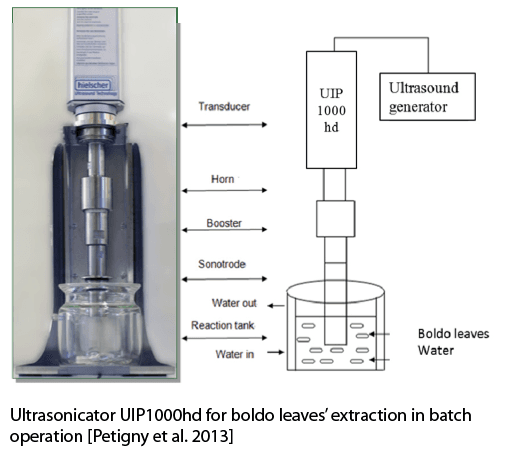 (2015) conclude that ultrasonic extraction of bioactive compounds from botanicals is the result of different independent or combined mechanisms including fragmentation, erosion, capillarity, detexturation, and sonoporation. These effects disrupt the cell wall, improve mass transfer by pushing solvent into the cell and sucking phyto-compound loaded solvent out, and ensure liquid movement by micro-mixing. Anthocyanins are vacuolar plant pigments, which can appear red, purple, blue or black. The colour expression of the water-soluble anthocyanin pigments depends on their pH value. Anthocyanins are found in the cell vacuole, mostly in flowers and fruits, but also in leaves, stems, and roots, where they are found mostly in outer cell layers such as the epidermis and peripheral mesophyll cells. Most frequently occurring in nature are the glycosides of cyanidin, delphinidin, malvidin, pelargonidin, peonidin, and petunidin. Prominent examples of plants rich in anthocyanins include vaccinium species, such as blueberry, cranberry, and bilberry; Rubus berries, including black raspberry, red raspberry, and blackberry; blackcurrant, cherry, eggplant, black rice, ube, Okinawan sweet potato, Concord grape, muscadine grape, red cabbage, and violet petals. Red-fleshed peaches and apples contain anthocyanins. Anthocyanins are less abundant in banana, asparagus, pea, fennel, pear, and potato, and may be totally absent in certain cultivars of green gooseberries. Anthocyanins are a great alternative to replace synthetic colouring agents in food products. Anthocyanins are approved for use as food colorants in the European Union, Australia, and New Zealand, having colorant code E163. Anthocyanins are found in fruits and vegetables and can be described as a type of water-soluble plant pigments. Chemically, anthocyanins are glycosides of anthocyanidins based of the 2-phenylbenzophyrylium (flavylium) structure. There are more than 200 distinct phytochemicals which fall into the category of anthocyanins. As a main colour pigment in wild fruits and berries, there are many sources from which anthocyanins can be extracted. A prominent source of anthocyanins is the skin of grapes. The anthocyanin pigments in grape skin consist mainly of di-glucosides, mono-glucoside, acylated monoglucosides as well as acylated di-glucosides of peonidin, malvidin, cyanidin, petunidin and delphinidin. The anthocyanin content in grapes varies from 30-750mg/100g. The most prominent anthocyanins are cyanidin, delphinidin, pelargonidin, peonidin, malvidin and petunidin. For example the anthocyanins peonidin-3-caffeoyl-p-hydroxybenzoyl sophoroside-5-glucoside, peonidin-3-(6″-caffeoyl-6‴-feruloyl sophoroside)-5-glucoside, and cyanidin-3-caffeoyl-p-hydroxybenzoyl sophoroside-5-glucoside are found in purple sweet potatoes. Besides their great capability to function as a natural food colorant, anthocyanins are highly valued for their antioxidative effects. Therefore, anthocyanins show many positive health effects. Research has shown that anthocyanins can inhibit DNA damage in cancer cells, inhibit digestive enzymes, induce insulin production in isolated pancreatic cells, reduce inflammatory responses, protect against age related decline in brain function, improve the tightness of capillary blood vessels and prevent thrombocyte aggregation.